Stylish and practical, this computer desk from Monarch Specialties is a terrific focal point for any contemporary office. This piece is designed with thick panels and lines accented with a natural finish. The manufactured wood material will offer sturdy and reliable support for years to come. This desk can hold your notebooks, computer, and more with its organized, compact design. This 48" long desk with fit in perfectly into any space. This contemporary, two tone, industrial look computer desk is the perfect combination of function, durability and design in a modern form. With clean lines, a chic cappuccino surface area and a sleek silver metal frame, this desk will add pizzazz to any home office or dorm room. The desk top provides ample surface area for a lamp, laptop or tablet while the drawer provides hidden storage for all of your additional office supplies. The perfect desk for small spaces! This simply designed contemporary style rectangular desk with a rich cappuccino is perfect for any space in your home. This versatile desk with sturdy angular legs has plenty of room for a laptop, a lamp, books or office essentials, and the single storage drawer accented with a sleek silver handle is useful for papers and office supplies. Easily suitable in a home office, a hallway or in a living room, this computer/writing desk brings practicality and style to small spaces. Let style and functionality be your guide when selecting this distinctive modern computer desk for your work space. The spacious rectangular floating top with an open shelving space underneath and two storage drawers offer ample space to tuck away office supplies, paperwork, or accessories. This versatile desk made from high quality MDF material is finished in a sophisticated laminated cappuccino on all sides. Beautifully accented with sleek silver plastic handles and sturdy u-shaped coated silver metal legs makes this contemporary designed desk a standout in any home office. Industrial meets rustic charm in this highly functional contemporary designed computer desk. Accented with strong black metal legs in a unique design, with plenty of storage that includes two side drawers with retro style metal pulls, and a wide middle drawer with a leather pull. 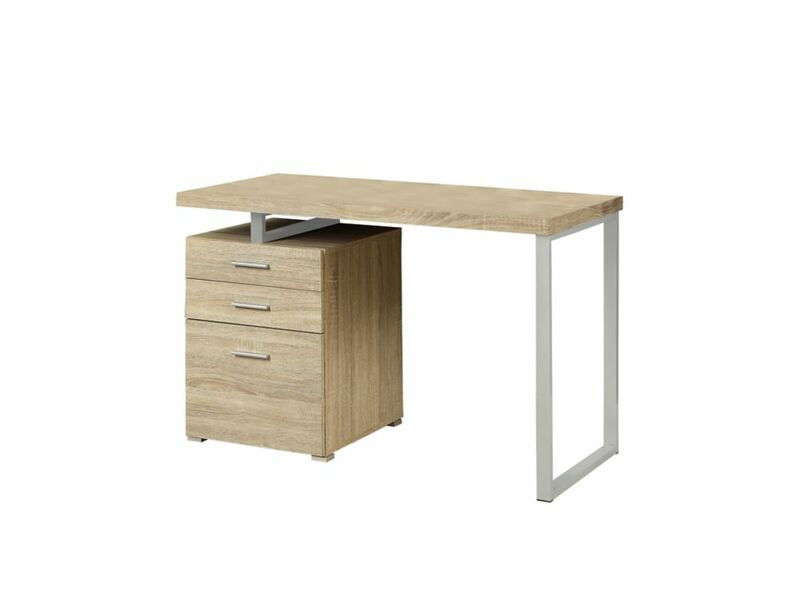 The spacious tabletop constructed from high quality MDF material with a smooth laminate grey wood grain finish can easily hold your computer and other office essentials. This stylish computer/writing desk will be a standout whether you place it in a corner of your living room, family room, or home office space. 24-inch x 30-inch x 48-inch Standard Computer Desk in Natural Stylish and practical, this computer desk from Monarch Specialties is a terrific focal point for any contemporary office. This piece is designed with thick panels and lines accented with a natural finish. The manufactured wood material will offer sturdy and reliable support for years to come. This desk can hold your notebooks, computer, and more with its organized, compact design. 24-inch x 30-inch x 48-inch Standard Computer Desk in Natural is rated 5.0 out of 5 by 2. Hello, yes the drawers can be assembled on the left or right hand side. We hope that helps. Thank you.